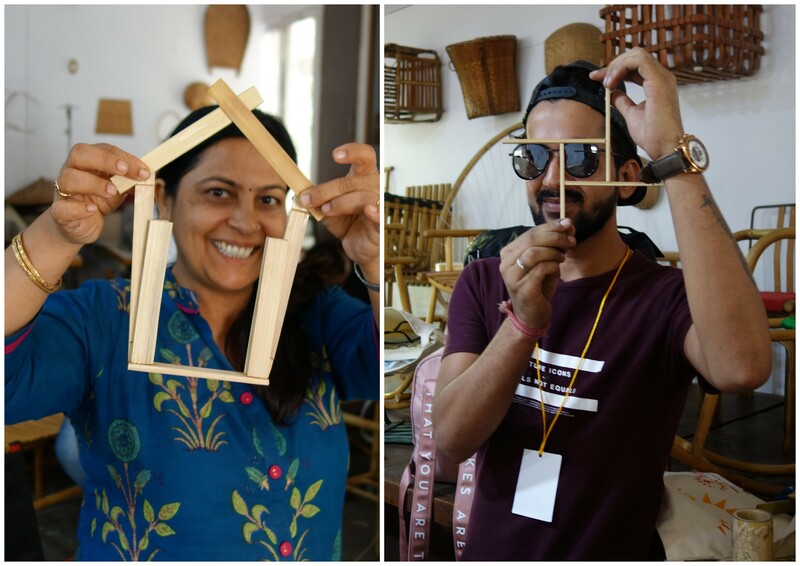 On the second day of the bamboo workshop participants were engrossed in exploring and experimenting with bamboo as a material. It was a fun filled experience for all. Participants were introduced with the different hand tools and the basic cutting n drilling processes. Bamboo cutting can be done using hand tools like saw, knife or with machine. Later sanding is done in machines or by using a sand paper to make the bamboo look finished. Bamboo can be bent by filing it and then heating it which would in turn could be easily turned and twisted. Purpose of this workshop is to teach the basic techniques being used in making products with bamboo, like cutting, drilling, filing, polishing, etc. This knowledge being shared can make them well equipped to make any basic product, and not to actually design but to explore and experience bamboo. Participants were asked to make splits with particular dimension and thickness using the techniques of cutting and finishing taught so far. Under the guidance of Pravin Solanki, Subrato sarkar, Anil bansal and Sudip participants played with the slits and explored different forms and created coasters and hot plates. Drawing is the basic step to design any product. Participants who have never sketched gave it an attempt and have shared their ideas through their drawings of what they wish to create using bamboo. Their excitement continued to the second day as well even in the hot summers of Ahmedabad as they came here with a motive to learn and explore.